Islam is the religion of all times, places and for the whole mankind. It is a perfect system of physical values. By practicing its laws Muslims all over the world not only attain spirituality but the greatest of all other glories and gain the wealth of health. In religion, Islam Allah Almighty described Halal and Haram that is to which we have to follow and forbidden for the sake of Allah (SWT). Halal is the thing or any action which is permitted by Allah Almighty. Haram is the action or a thing which is forbidden by Allah (SWT). Religion Islam prescribes a set of dietary guidelines for its believers to follow. For Muslims, these dietary rules to follow are fairly straightforward when it comes to the foods and drink that are allowed and forbidden. More complicated are the rules for how food animals are killed. 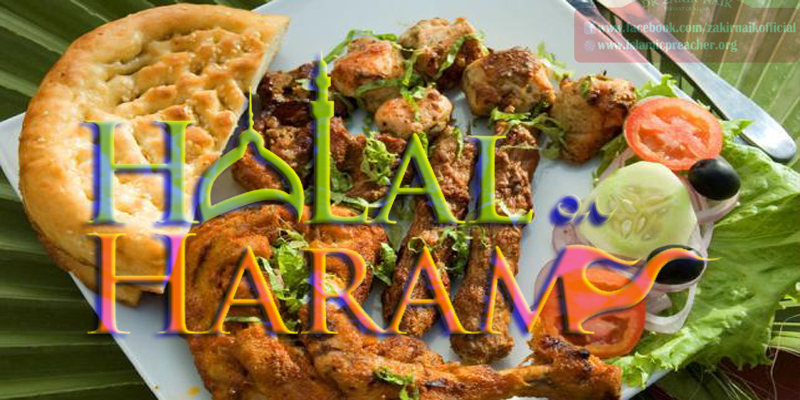 In general, Islamic dietary law or rules distinguishes between food and drinks that are halal and those that are prohibited or haram by Allah Almighty. About halal food and drink Allah Almighty said in Holy Quran in these words: “Lawful to you is the hunting of sea animals and their use as food” (Quran, 5:96). In another verse of Quran Allah says: “Muslims are allowed to eat what is “good” (Quran, 2:168). That food and drink that is pure, clean, nourishing and pleasing to the taste. In general, everything is halal and allowed except what has been specifically forbidden by Allah Almighty. Muslims are advised by their religion Islam to abstain from eating certain food and drink. This is said to be in the concern of health and cleanliness, and also in obedience to Allah (SWT). In Holy Quran, the below-mentioned food and drink are strictly prohibited. In religion Islam, much attention is given to the slaughtering manner in which animals’ lives are taken in order to provide food. Muslims are advised to slaughter their livestock by slitting the animal’s throat in a swift and merciful manner, reciting Allah’s name with the words, “In the name of God, God is Most Great”. In Holy Quran, Allah Almighty said: “So eat of that [meat] upon which the name of Allah has been mentioned if you are believers in His verses. And why should you not eat of that upon which the name of Allah has been mentioned while He has explained in detail to you what He has forbidden you, excepting that to which you are compelled. And indeed do many lead [others] astray through their [own] inclinations without knowledge. Indeed, your Lord – He is most knowing of the transgressors. And leave what is apparent of sin and what is concealed thereof. Indeed, those who earn [blame for] sin will be recompensed for that which they used to commit. And do not eat of that upon which the name of Allah has not been mentioned, for indeed, it is grave disobedience. And indeed do the devils inspire their allies [among men] to dispute with you. And if you were to obey them, indeed, you would be associate [of others with Him]” (Quran, 6:118-121). This is an acknowledgment that life is sacred and that one must kill only with Allah Almighty’s permission, to meet one’s lawful or permitted need for food. The animal should not suffer in any way, and it is not to see the blade before its slaughter. The knife must be sharp and free from the blood of any previous slaughtered animal. The animal is then bled completely before consumption. Meat prepared in this manner is called zabihah, or we can say it halal meat.